The trade story for that image on December 18th 2006 is not the profit of $1400 dollars. The story involves the missed VTR trade signals that would have resulted in a profit of +10k trading day along with realizing serious problems in my documentation of my chart configuration on my monitors. Thus, I want to highlight the importance of documenting a trading day beyond a daily broker statement and real-time chat room. In 2006 I thought my documentation was good enough...simple & easy. Yet, in comparison to what I do today in my trade journal...my documentation back in 2006 was a joke and I often had missed trade signals like that on December 18th 2006 because of my poor documentation prior to 2006 didn't prepare me for changes in volatility that impact my price action analysis, trade decisions and the way I setup key charts on my monitors for the trading day. Simply, I would soon learn in 2007 (after trading days like that on December 18th 2006) that my chart configurations can not be static (the exact same) throughout the trading day as if the markets or volatility never changed. Trade methods for TheStrategyLab involves intermarket analysis, intramarket analysis, volatility analysis, WRB Analysis and trade management, trader psychology and so on...all working together to help with my consistency. Yet, rarely do you see traders using intermarket analysis and/or intramarket analysis to exploit trade opportunities. These two particular aspects of trading I learned from institutional traders...traders that have a big foot print on the price action. Volatility Trading Report (VTR) - Today, the Volatility Trading Report (VTR) trade signal strategies are improved in comparison to the VTR in 2006 with clearer price action definitions along with more emphasis on the client to document/journal their trading...resulting in less missed trade opportunities that are profitable. Your one time payment of $473 will give you access to the VTR trade signal strategies, STR trade signal strategies, APAOR trade signal strategies, AJCTR trade signal strategies, Directional Creeper Movement (DCM) Analysis & Trade Signal, FVB trade signal strategies, WRB Analysis Tutorial Chapters 4 - 12 (advance price action only) and the #VolatilityTradingTSL real-time private chat room. Reminder - The Volatility Trading Report (VTR) is tax-deductable. Thus, you'll be able to deduct the cost of the VTR from your taxes next year. Simply, due to the fact that I use the price action of other markets to make trade decisions in my trading instrument...often the chart configuration would change through out the trading day...I needed to document (save images) of the exact configuration of all of my charts on my monitors so that I can understand what price action influenced a particular trade decision...days, months or years later. For example, the image above/left shows exactly what my main monitor looked like but it doesn't show the other two monitors nor did I document those other two monitors in my private trade journal. 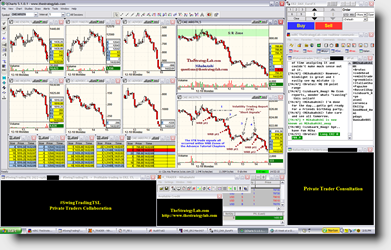 Those missing two monitors contained charts via FutureSource workstation of different key markets that signaled trades in the Russell 2000 Emini Futures & gave me an understanding of the flow of the intraday price action in the Emini futures. All that missing info not being documented was the primary reason why I consistently missed profitable trade signals at a later date whenever there was a trend day or big swing point day (trend reversal). Today, in contrast, I've learned to document all my monitors in my private trade journal at the time of each trade because my chart configurations changes throughout the trading day as volatility changes but I only pull one image from my laptop (broker PnL statement without the charts) for use in the public trade journal. Yet, I do share my chart configurations with fee-base clients but no longer with the public due to trolling by others. In addition, I make sure I document the quantitative statistical analysis of WRB Analysis for each trading day with hourly market context & key economic reports schedule times because it impacts my position size management and trade management from trade to trade. Position size management & trade management are a critical aspect to my trading profits and I don't follow the herd nor do I follow any traditional way of deciding my position size / trade management for a particular trade. This info, why & when I change position size is not shared directly in the Volatility Trading Report (VTR) for security reasons just in case someone decides to violate my copyright protection. Instead, I only share position size management with fee-base clients that ask about such in clients private threads, private message in the chat room, skype or during screen sharing while trading...the same for the advance trade management info. Volatility Trading Report (VTR) - Your one time payment of $473 will give you access to the VTR trade signal strategies, STR trade signal strategies, APAOR trade signal strategies, AJCTR trade signal strategies, Directional Creeper Movement (DCM) Analysis & Trade Signal, FVB trade signal strategies, WRB Analysis Tutorial Chapters 4 - 12 (advance price action only) and the #VolatilityTradingTSL real-time private chat room.